Illinois center Maverick Morgan's postgame remarks Jan. 11 adds fuel for Saturday's rematch at Crisler Center. Ann Arbor — It was the shot heard around the Michigan basketball team’s locker room. The dig at the team’s lack of toughness and grit didn’t sit well with several Wolverines. More than a week later, it still doesn’t. “Believe it or not, I'd be lying if I said it didn't (motivate us),” senior guard Derrick Walton Jr. said. “I don't think it motivates you any more than a coach getting on you and telling you that you need to pick it up or a teammate. While the remark won’t be written on a dry erase board or plastered on the walls in the locker room, Walton said it has become an “unspoken thing” that will be in the back of their minds when the two teams square off again Saturday at Crisler Center. Michigan coach John Beilein said initially he didn’t view Morgan’s comment as a slight, adding that being white collar doesn’t always translate to being soft. “My dad worked his tail off for 40 years in a paper mill. 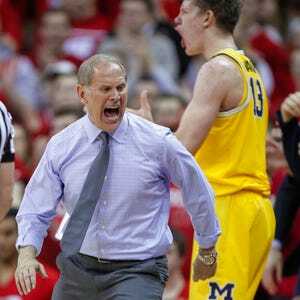 But he also happened to work in the office and wore a white collar every day and I never saw anybody work so hard in my life,” Beilein said on WTKA’s “Michigan Insider” on Friday morning. “I think it means that we're not a tough team, so they don't think we're a tough team and our kids know that that's a question mark many times. Through the first four games of Big Ten play, Michigan’s defense was a punching bag that took every team’s best shot. It allowed Iowa, Penn State, Maryland and Illinois to shoot at least 48 percent from the field and 42.1 percent from 3-point range. But following the Illinois beatdown — Michigan’s only conference game decided by 10 points or more — Walton spearheaded a players-only meeting to talk about what needed to be done to turn the season around. In the two games since, the Wolverines have made subtle strides on defense. Michigan was able to come up with just enough stops down the stretch against Nebraska to gut out a win, despite allowing the Cornhuskers to shoot 56.3 percent from the field and 50 percent from beyond the arc. The Wolverines followed that up with their best defensive performance in Big Ten play, limiting Wisconsin to 45.3 percent shooting and 37.5 percent on 3-pointers in a narrow loss. “I think (we have) a locker room full of tough guys. They just show it in different ways,” said Walton, who was a “full go” at Friday’s practice after suffering a sore lower back at Wisconsin. With NCAA Tournament hopes dimming, that urgency is raised to another level as the Wolverines (12-7, 2-4 Big Ten) enter a stretch with four of five at home and a vital opportunity to climb back into the Big Ten race. And maybe even change some minds in the process. Outlook: Senior F Zak Irvin is coming off back-to-back 20-point performances for the first time since the start of the 2014-15 season…Michigan is shooting 48.9 percent (129-for-264) from the field and 42.4 percent (42-for-99) from 3-point range over the last five games…Illinois has lost two straight since beating Michigan at home on Jan. 11.